The Gallery Owner of Rangoon, by Carlos Sardiña Galache, published in FronteraD. Click here for original article, which features even more pictures. This article has been translated into English and slightly edited for the Web. All photographs are by Carlos Sardiña Galache. On the first floor of a dilapidated building in downtown Rangoon, a narrow staircase leads up to a small space that probably hold more contemporary art per square meter than anywhere else in the city: the Pansodan Gallery. Unlike other galleries, such as those at Bogyoke Aung San market that only sell paintings with “exotic” themes to satisfy the wildest orientalist fantasies of tourists, Pansodan reveals an art scene far richer than one would expect in a country like Myanmar (Burma) — mired in poverty, isolated for years from the rest of the world, and tightly controlled by one of the most repressive dictatorships in the world. In its three years, the gallery, open every day of the week until six in the evening, has become a meeting place for artists and art enthusiasts. Burmese and foreigners all visit the gallery, not only to buy or sell pieces of art, but to have a tea, exchange ideas, attend a poetry reading, or simply to relax for a short while. The gallery’s owner, Aung Soe Min, is a gentle and kind man that welcomes visitors with Burmese hospitality, and always relaxed and happy to answer any questions. Aung Soe Min was born 41 years ago in a small town in central Burma. Testifying to the country’s isolation, he says he never met a foreigner until he was twenty-five years old. After studying engineering, he spent several years in the publishing business and began collecting books. Today it has one of the largest libraries of Burma, and is visited by scholars from around the world. In the late 1980s, after the collapse of the regime of General Ne Win and his “Burmese Way to Socialism,” there was a slight cultural opening when the military junta that succeeded tried to attract foreign investment. “The country was changing and I tried to take advantage of this to study everything I could,” says Aung Soe Min. He also tried to make films, but couldn’t always get the necessary permits, which, combined with a lack of official support or distribution, made it a nearly impossible undertaking. 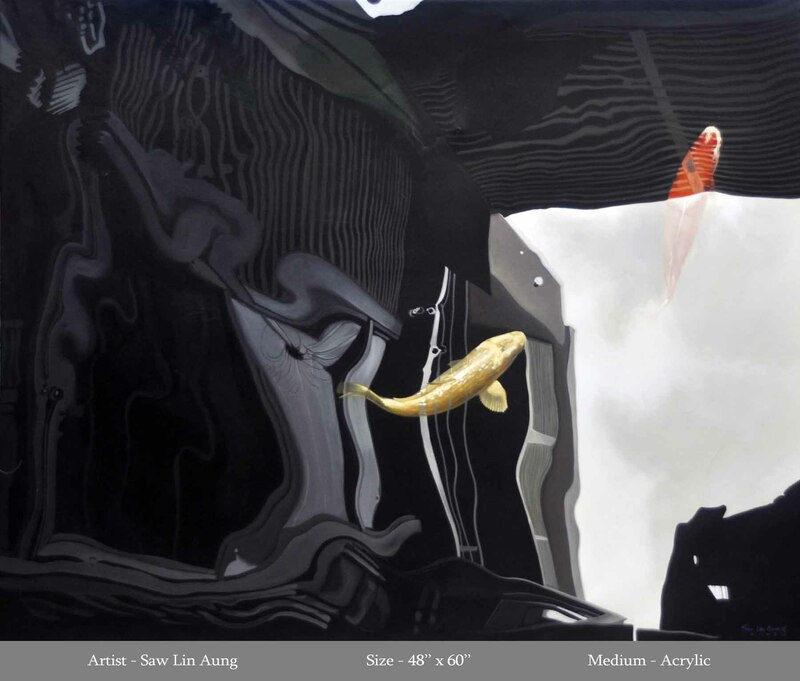 During those years, Aung Soe Min met numerous writers and artists, and seeing that that the country lacked the “infrastructure and market necessary for artists to distribute their works,” he decided to open his own gallery in 2005. It took him three years, but in 2008, after overcoming many obstacles and using the profits he made from selling “three especially valuable paintings” he was able to buy a property on downtown Pansodan Street, close to the old colonial neighbourhood at the heart of the city, and open his gallery. According to Aung Soe Min, works from some two hundred artists are for sale at the Pansodan Gallery, which is not hard to believe since every day new paintings appear on the walls or scattered around the floor. “Artists will often come in and tell me they need money urgently. They bring me a painting, and if I like it I buy it myself and then try to resell it. Most other galleries, on the other hand, usually don’t pay artists until they sell their works,” he explains. It’s not easy being an artist in Burma. The poverty, lack of opportunity, and scarce knowledge of or interest in contemporary art make developing an artistic career far more difficult than in other countries. One of the young artists that displays his work at the Pansodan Gallery, Ein Aye Kyaw, made a hard living painting by commission, especially traditional landscapes after studying zoology and fine arts at the University of Rangoon. He decided to devote himself professionally to art five years ago when he saw a man painting on his street and thought “he’s the only person that really looks tranquil and happy.” That man became his first teacher. 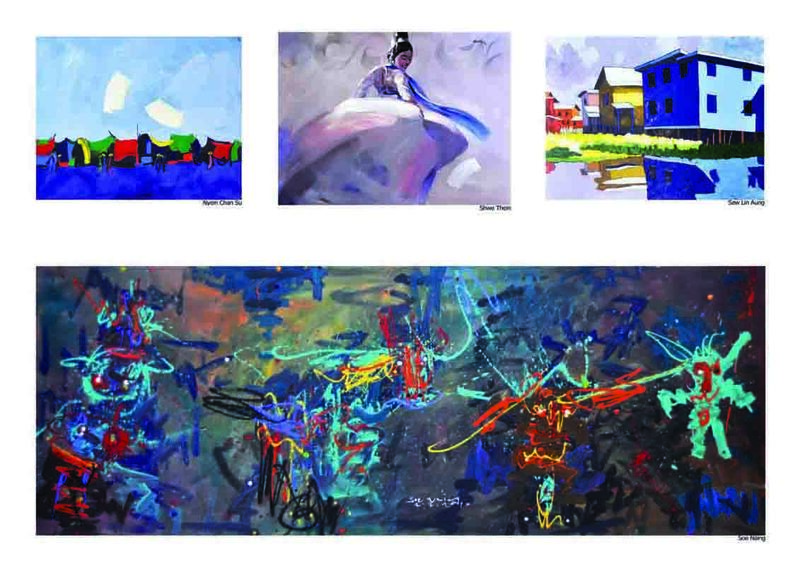 Ein Aye Kyaw’s paintings are of a simple, impressionist style that he polishes in each painting, depicting ordinary scenes or images that, as he explains, draw you in without your really knowing why – an old taxi in the rain, a child playing in a park, or the strange structure of the Arakanese Kingdom, a half-pagoda, half-military fort palace that came to him after seeing an official building in Naypyidaw, Burma’s new capital that the military junta built in the middle of the jungle six years ago. Looking around the gallery, one may find the expressive sculpture by the artist Ye Min: a guitar with teeth in the sound hole biting its own strings. The gallery also exhibits portraits of the Burmese democratic opposition leader Aung San Suu Kyi, which would have been unthinkable just a few months earlier. In any case, government control over the arts is not as strict as with literature or the press. “The government simply isn’t interested and doesn’t care about art. They don’t help us, but they don’t cause problems either. They ignore us,” comments Aung Soe Min. But artistic freedom is sometimes constrained by prejudice and bias. Burmese society is profoundly conservative and does not tolerate, for example, the exhibition of nudes, nor is it legal. At the same time, the art world is imbued with a sense of tradition and hierarchy, turning itself into a closed shop where innovation is not always well received. 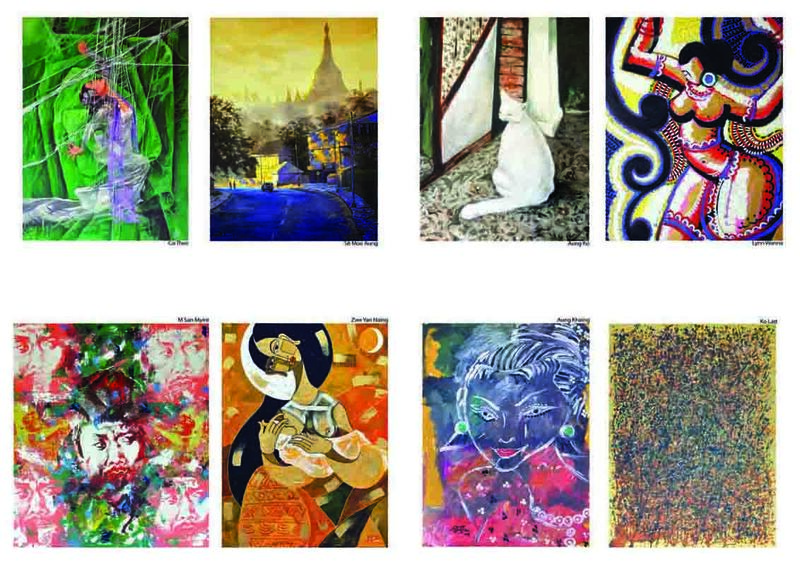 The rejection of modern art forms in Burmese art dates back to the colonial era, when for many years “Western” influence was considered a threat to the cultural purity of the nation. 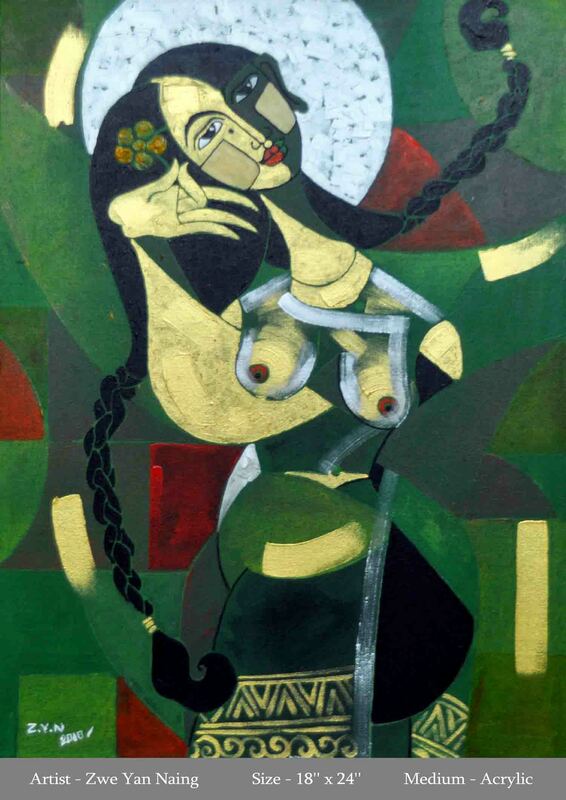 Painters like Bagyi Aung Soe (1924-1990), considered by many to be the father of modern Burmese art, fought a long cultural battle for the acceptance of artistic ideas that were looked down upon as “foreign” by the purists. 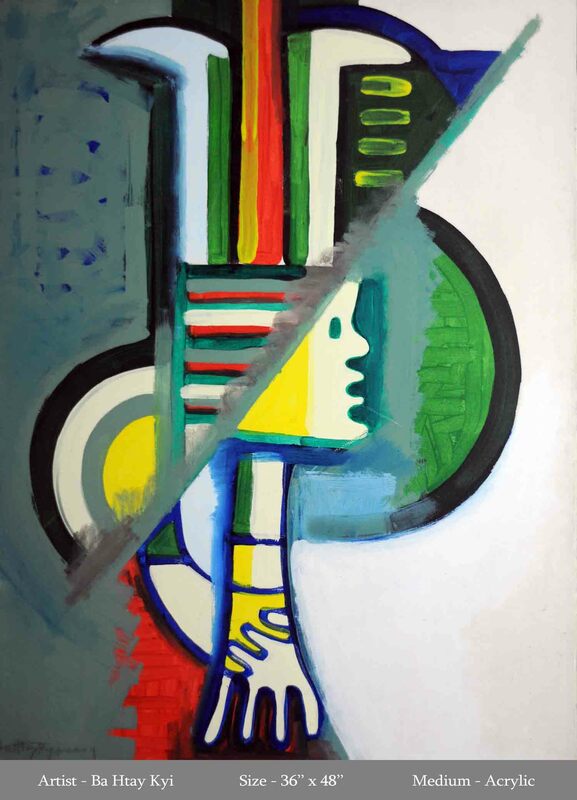 From this arose the expression “crazy art” to describe modern and abstract art. 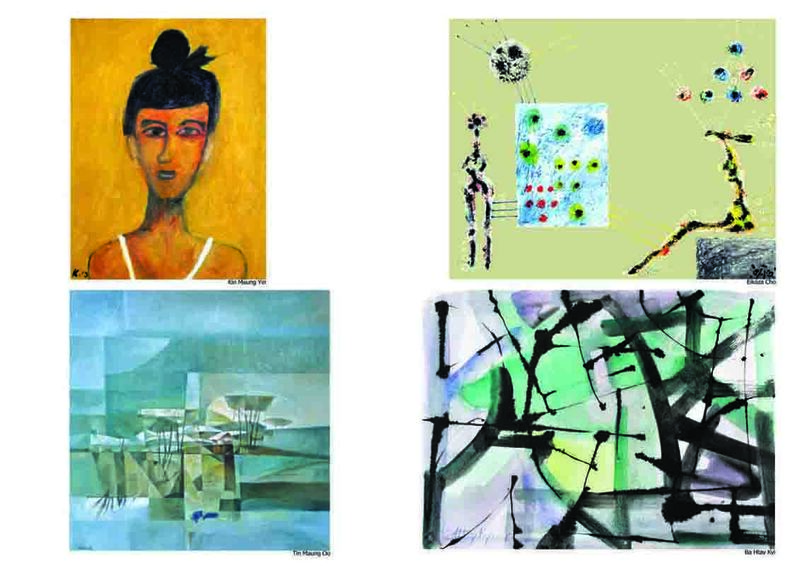 This battle has not yet come to an end, but the pieces on exhibit at the Pansodan Gallery show the growing presence of contemporary artistic styles, and that realist art lives side by side with the abstract, the expressionist, or pop. 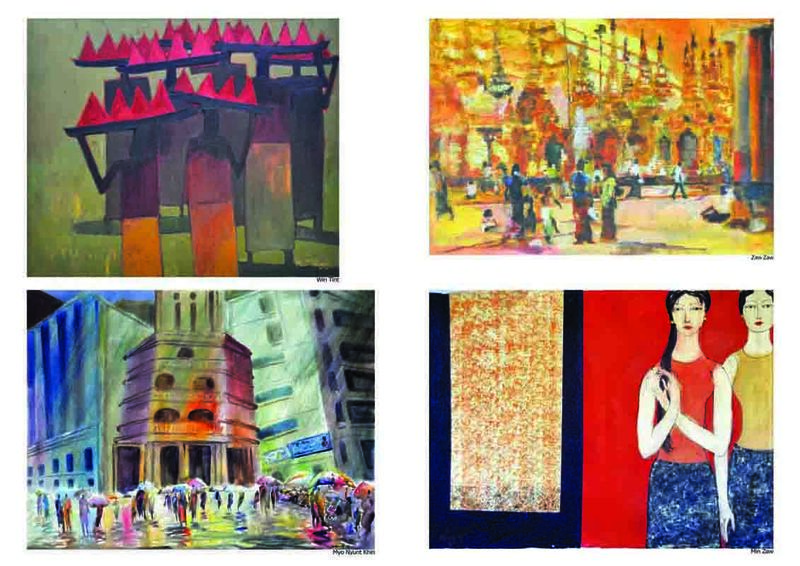 The Burmese artistic scene is very eclectic, and has seen a slight boom in recent years, as well as a surge in interest overseas. 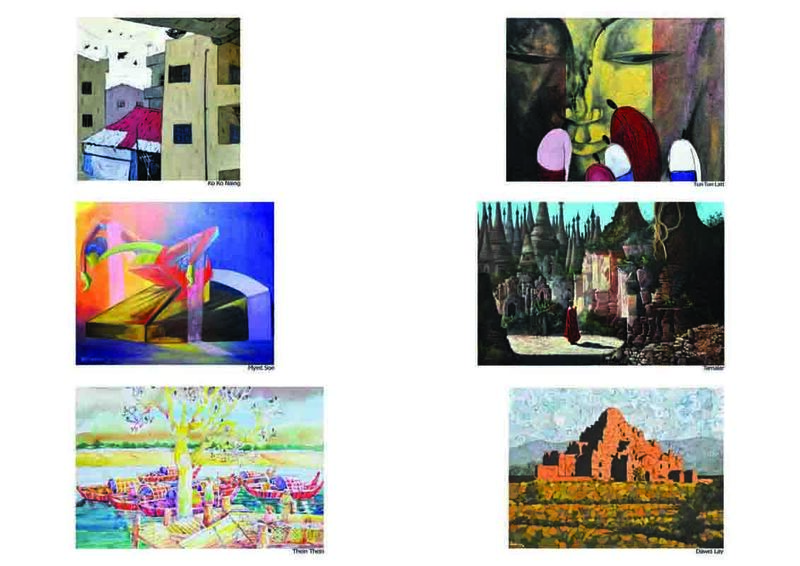 Several artists now exhibit their works in neighbouring countries, as well as the United States and United Kingdom. Driven by his love of collecting, Aung Soe Min has embarked on a parallel project, a history of Burmese graphic art since the colonial era. He is working together with Kirt Mausert, a young American anthropologist living in Rangoon who also helps manage the gallery. Mausert explains that the goal is to publish a book that “explores, through publicity and propaganda, the changes in social relations that the country has experienced in recent history,” an unprecedented approach in Burmese historiography. For this project, they have created an archive of old photographs, newspapers, postcards and propaganda advertisement that they have acquired at innumerable places around the streets of central Rangoon. In many cases, it’s the vendors themselves that come to the gallery to offer the materials they’ve acquired. “The historiography of Burma has suffered many distortions in recent years,” explains Soe Min. “In any case, it is based on the texts, not the images produced by society, which aren’t treated with why importance when it comes time to reconstruct history. Hardly anybody values these kinds of things, and I think they should be conserved in a museum.” Faced with neglect by the government, the conservation of the visual legacy of the country, as well as promotion of cultural and artistic life, depends almost exclusively on the enthusiastic work of people like Aung Soe Min. The Inside/Outside exihibition was at the SateFL!GHT Gallery, 2332 S. Presa, in San Antonio, Texas in November 2011. It has now concluded, but some items are still available online. In early 2011, Callie Enlow spent months teaching in Yangon, and — who wouldn’t? — succumbed to the fascination of the possibilities of the country. Many people feel for the people, but only a few choose to do something about it. Callie is one of those people. She took a route through art. 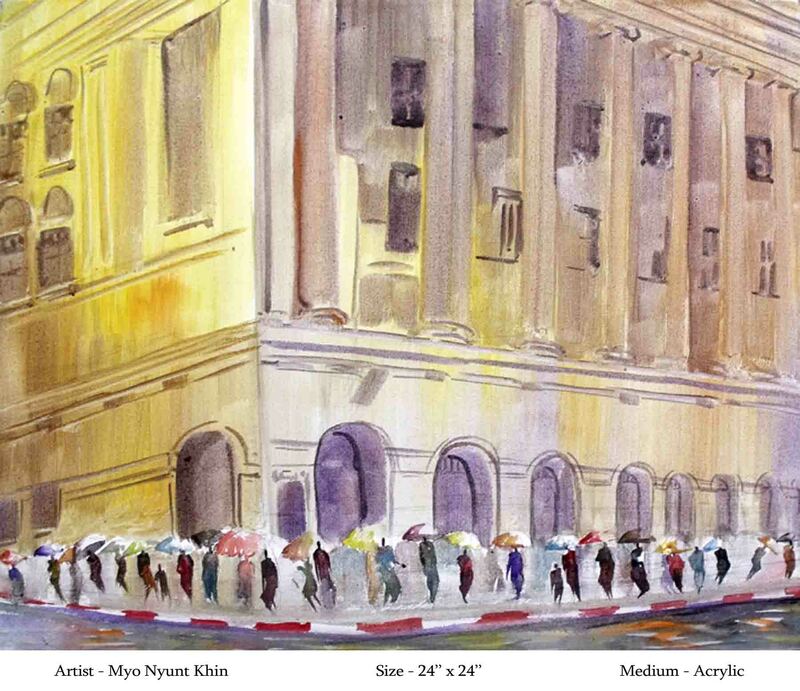 She has carefully chosen paintings from eight artists and arranged an exhibition in San Antonio. None of this art will make anyone think “That’s realistic, isn’t it!” But then, Burma does not make you think that either. The art is wonderful, Callie is knowledgeable, and we hope that people will gather their friends, go there, admire the art, be drawn in more deeply, and deepen their understanding of our world, whether through talking to Callie, enjoying the art, or both. A map showing the gallery is here. More information about it can be found at this link, and thanks to SMART too! Never trapped in the moment. Continually changing and seeking. Continually challenging and redefining. Continually shifting and questioning. We all slip along time into the future, revising our conceptions and refining our perceptions. This exhibition of contemporary art is an invition to re-interpretation. On display is a selection of paintings and multi-media works to explore — new aesthetics, emerging meanings, new generation — to bring you to diverse vantage points from which to re-evaluate your impressions. Come to the exhibit and free your mind into the art as the artists have freed their inspiration. Some will reveal meanings, some will confound. You may choose to assign a title — but you may find yourself taking it away again, refining, questioning, seeking.